Around 2010 I facilitated an acquisition of Hawaiian art from the late Molokai artist Bill Kapuni for the National Museum of the American Indian. That acquisition included a beautiful model voyaging canoe. Canoe builders and Friends of Hokulea Jay Dowsett and Tay Perry told me they thought it was a model of the Mookiha canoe being built on Maui. The hulls are strip-planked to give the heart shape characteristic of Hokulea. All the pieces are finely finished. Apparently the curved deck idea was dropped. 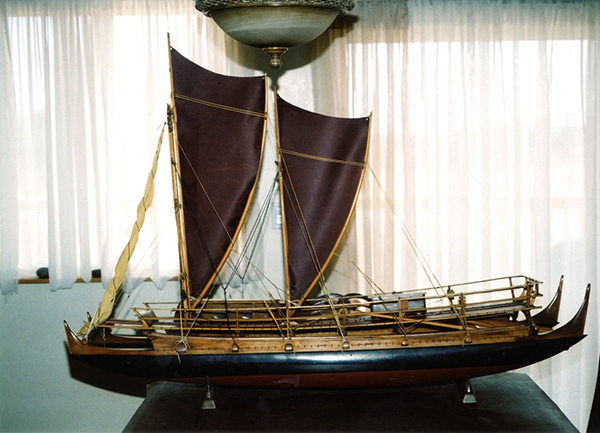 Note the jib, a later addition to Hawaii's voyaging canoes.